"This is a great recipe for those that like the crispiness of fried chicken, but don't want all of the greasiness!" Preheat an oven to 375 degrees F (190 degrees C); grease a 9x12 inch baking dish. Place the cereal in a large plastic zipper bag and crush the cereal into crumbs. Add the garlic salt and seasoned salt; shake the mixture together in the bag to combine. Pour the cereal crumb mixture out into a shallow bowl. In another shallow bowl, beat the egg with the milk. 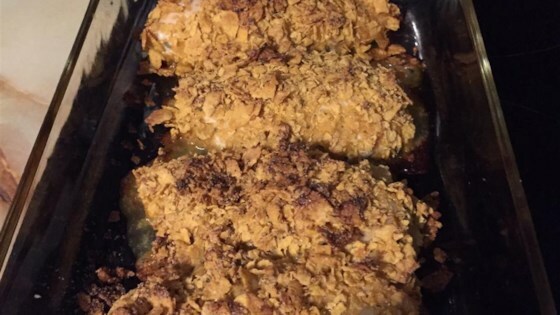 Dip each chicken breast half into the milk mixture, then into the crumb mixture, coating the chicken well with crumbs. Place the coated chicken breasts into the prepared baking dish. Bake in the preheated oven until the cereal coating is golden brown, the chicken is no longer pink in the center, and the juices run clear, about 40 minutes. An instant-read thermometer inserted into the center should read at least 165 degrees F (74 degrees C). I don't know what I did wrong but this was not too flavorful. I probably wouldn't make it again. Substituted Cornflakes as I did not have Chex cereal. Both my husband and my 3 year old son liked it. My husband took one bite and said it tastes like fried chicken. Very good recipie. I substituted Post Honey bunches of Oats and it came out sweet.